I have been a fan of Malbec for a while, usually from Argentina. But I like French Malbecs from Cahors a lot. 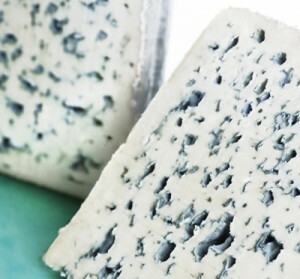 I think Bleu d’Auvergne would be an ideal match. This is a cow’s milk blue cheese from Auvergne region in France, just north and east of where Clos la Coutale is made. When Taylor said the wine was “hearty,” I immediately thought of a blue cheese. The cheese has a good bit of flavor; it’ll stand up to the boldness of the wine. Being a big cheese, it will still have a broad flavor profile — you can taste herbs, grass and cave flavors. It comes wrapped in foil and look for a very moist slice — this shows it has been handled and cared for well. This is one of the cheeses you must serve at room temperature to get the most pleasing flavors. I recently took a trip to Woodstock NY, and this song should be the perfect match for this wine and cheese combo. Email Raymond with cheese comments or questions.